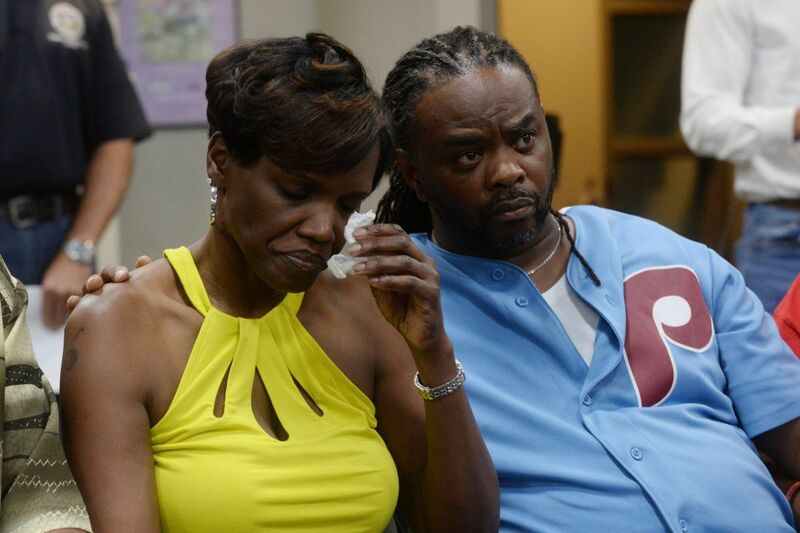 Michelle Roberson and Rodney Roberson, parents of Bianca Roberson, weep at the press conference to announce capture of a suspect in the alleged road rage slaying. David Desper regularly kept a .40-caliber Smith & Wesson semiautomatic handgun in the center console of his red Chevrolet Silverado pickup truck, according to a friend. Desper owned other weapons and sometimes went to the Targetmaster shooting range in Chadds Ford, said the friend, Greg Parker, who had worked with Desper for three years. But Parker is convinced that Desper never used that gun outside of a shooting range before about 5:30 p.m. on June 28. That's when, investigators allege, the 28-year-old Trainer man shot and killed Bianca Roberson, 18, as the two were jockeying for position at 60 mph on a stretch of Route 100 in West Goshen Township where two lanes narrow to one. Neither Parker nor anyone else knows for certain what might have set off Desper, who surrendered four days later. Court documents make no mention of a statement, and Parker said he believes Desper had no intention of firing a fatal shot. Police say this was a clear case of road-rage murder. And some evidence suggests that road-rage violence has increased dramatically. At the very least, reported instances of such incidents have spiraled. A national study released three months ago found that cases of road rage involving firearms more than doubled from 2014 to 2016, from 247 reported incidents to 620 in 2016. The Trace, a nonprofit site that reports on gun violence, used data from the Gun Violence Archive, which tracks incidents using police and media reports. "I'm always skeptical when someone says anything doubled over a short period of time," said Gary Kleck, professor emeritus of criminology and criminal justice at Florida State University, adding that media reports aren't always reliable indicators.. But a spike, he said, "wouldn't surprise me." Why would road-rage incidents be on the upswing? Frank Farley, a psychologist at Temple University and former president of the American Psychological Association, said he believes there could be a variety of factors, including more congested highways, busier schedules, and an increasing acceptance of aggressive behavior. "I see everybody angry. I see everybody in a hurry," Upper Darby Police Superintendent Michael Chitwood said. "They're ready to fight." Whatever the reasons, in the last decade several cases have received national and local attention. In 2007 Britt Reid, the son of former Eagles coach Andy Reid, allegedly confronted another driver on Route 23 in West Conshohocken with a .45-caliber handgun. The following year, Christian Squillaciotti, a veteran Marine who at the time lived in South Philadelphia, shot Gloucester Township native Thomas Timko on the Schuylkill Expressway after Timko cut him off. Timko was left with permanent brain damage. Last October, a school bus driver was accused of flashing a gun at a fellow motorist, who got out of his car on the shoulder of the Vine Street Expressway after, he said, the bus driver was tailgating. A couple of months later, former NFL player Joe McKnight was shot and killed in an apparent road-rage confrontation in a New Orleans suburb. Pennsylvania and New Jersey State Police and the Philadelphia Police Department said last week that road-rage incidents are not uniformly tracked by law enforcement, making any trends difficult to measure. A road-rage incident could result in a charge of reckless driving, while such a confrontation with a gun might result in a charge of terroristic threats. Pennsylvania State Trooper Timothy Greene said that he sees a few road-rage incidents involving guns each year, and that in his jurisdiction — which includes Philadelphia, Montgomery, and Delaware Counties — he has noticed that drivers have become more aggressive. In the last year in Upper Darby, Chitwood said, there were perhaps four incidents of road rage involving guns — more than he can recall in previous years. "There are more guns out there than ever before," Chitwood said. "And you never know who's armed with a gun when you confront somebody." Farley, the Temple psychologist, said he wished he could sit down with Desper, as well as others accused of road-rage-induced gun violence. "We need more studies on the psychology between the ears of the people who do these things," Farley said. "I wish my field had more answers." For police, the tragedy of Roberson's death provides a somber teaching opportunity. "I think there is just an increased awareness of the hazards of road rage," said Sgt. Jeff Flynn, a spokesman for the New Jersey State Police. "It's a good opportunity to remind motorists not to engage." Flynn said he advises motorists not to confront anyone while driving. If someone is following you, call police instead. In Upper Darby, Chitwood said he tells motorists to pull to the side of the road and let aggressive or hurried drivers pass. "If you challenge them," Chitwood said, "you might end up dead." On Friday, the Roberson family buried Bianca, a recent Bayard Rustin High School graduate who was set to attend Jacksonville University in the fall. Cousin-in-law Loretta Porter said Bianca's brothers told a packed St. Paul's Baptist Church of "the coward who stole their sister away from them." Desper, meanwhile, remained jailed without bail Friday, charged with first- and third-degree murder, possession of an instrument of crime, and reckless endangerment. Inquiries at the homes of relatives have gone unanswered. Earlier in the week, Bianca's father, Rodney Roberson, said in an interview that he had initially wondered what his daughter could have done on that quarter-mile stretch of highway to set off her killer. But Roberson couldn't think of anything. "She would never challenge someone like that," Roberson said. "What could my daughter have done to make that man that mad?"